Decant your favorite wine with this stemless glass, designed to aerate to perfection. One night over a bottle of wine, Dillon Burroughs and his father wondered, "why isn't there a glass that can open up wine when poured directly into the glass? Decanting a bottle is such a racket..." That night, the Fountain Aerating Wine Glass was born. Pour your favorite vintage into the central cell of these stemless goblets, and watch as it cascades into the glass, instantly releasing the wine's full potential of flavors and aromas. Avoiding the need for cumbersome decanters, these elegantly designed glasses automatically maximize the bouquet of your favorite bottles of wine. As an alternative, you can chill your whiskey without watering it down by adding ice to the central cell before you pour! Designed in the USA by Dillon Burroughs; made in China. Dillon Burroughs has always had an inventor's spirit. "My entire life, I have viewed things not as they are, but how they can be better," he says, adding that it's a trait he inherited from generations of family members. 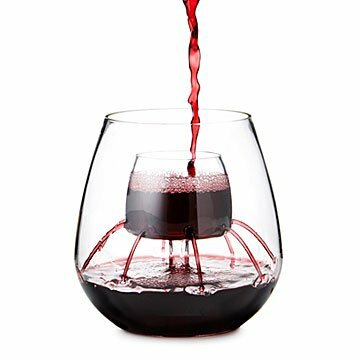 In fact, it was over wine with his father that he came up with the idea for his first product, the Aerating Wine Glass. Picturing the reactions of people as they use his products keeps the Los Angeles native dreaming up new ideas. With his signature glass, he says, "it was the vision of family and friends spending quality time with each other and getting a little bit of extra enjoyment or excitement out of sharing a bottle of wine with one another." So the concept it really cool, the drink looks neat when pouring, but sone of the wine stays in the smaller inside area, as the holes are not all the way down at the bottom. If you tip the glass a little you can get the wine to go through the hikes and I to the bottom area for drinking but overall a clever idea and a good conversation piece. I love how effective this product is. It makes a lot of sense and provides immediate aeration of the wine. I would definitely buy it again and again for all of my wine friends. It's difficult for people with small hands to hold. I wish I could order them with stems. Works great and is perfect for any wine lover. My mom loved this and can taste a difference in her favorite wines. Perfect for the wine drinker who has everything. My daughter has everything she needs and I wouldn't even try to find her clothing because mothers cannot pick out clothes their daughters will like if they are older than 7. These glasses are perfect for her. They are not only a pretty glass to drink from, but a conversation item as well. I was showing a gentleman here at work what I got her and he said he was going to order a set for his wife. I really hope so....this is one of the few gifts this Christmas that I know I got right. First, my sisters love wine. Second, we have a holiday exchange where we choose gifts, unwrap them, and then steal the gifts. I expect these wine glasses to be the hit of the evening with each sister wanting to be the one to take them home. I have this glass with the stem and it tipped over on the swing and broke. I love the glass so I wanted another. When I found the stemless ones I knew this would be better for outside. It is great. This is a cool aerating glass. I purchased for my friend's birthday and now want one for myself. Cheers!